Buddy Rinse is made with pure botanical extracts and natural oils to create the best conditioner possible. Buddy Rinse has been specially formulated to soften, shine, detangle, and revitalize your pet's coat without using any harsh chemicals. Buddy Rinse works into your pet's coat easily yet rinses completely, leaving a light & refreshing lavender and mint scent. It is pH balanced to be gentle on your dog's sensitive skin. It is free of potentially harmful SLS and ALS, and is safe for use on puppies. 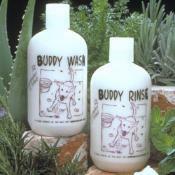 Buddy Rinse is soap free and can be used in conjunction with topical flea treatments. Ingredients: Herbal conditioner base, aloe vera juice, essence of lavender, essence of mint, wheat protein extract, rose hip oil, kukui nut oil, olive oil, wheat germ oil, jojoba oil, chamomile extract, sage extract, nettles extract, rosemary extract, allantoin, vitamin E, vitamin C, vitamin A, vitamin B5. Comes in 19 fl. oz. bottle. Made in USA. Recyclable packaging.